We begin our tour just a few short blocks from Ballard's Historic district at Lagunitas Taproom and Beer Sanctuary. 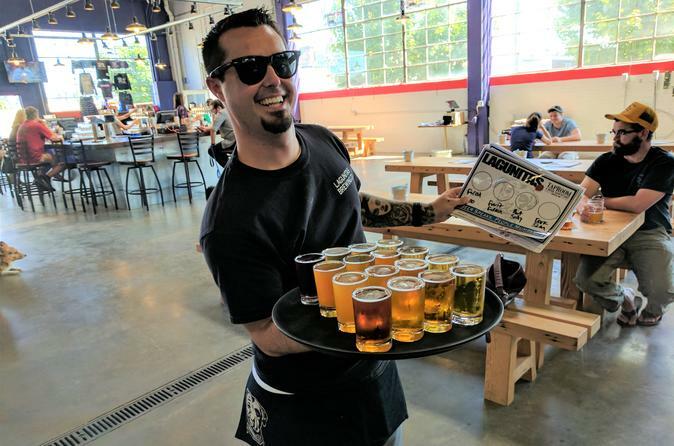 One of Ballard's newest breweries is actually one of California's oldest. The Ballard brewery features old favorites and beers only brewed here in Washington. Even if you think you are familiar with Lagunitas there will be something here you have never tried before. NW Peaks' Bergschrund Taproom occupies a space that has been a tavern since 1947. This nano-brewery now brews beers that are inspired by the Alpine peaks of the Cascade and Olympic mountains. The owner and brewmaster is an avid mountaineer and you will get to sample ales named after NW Peaks such as: Eldorado Pale, Redoubt Red and Challenger IPA. We'll end our tour at Peddler Brewing Company. As you may guess from the name this brewery is geared toward bicycle riders (pun intended). But everyone enjoys their beers, even walkers like us. Besides the wall of broken bicycles, a large beer garden and plenty of bike racks you will enjoy some of the finest beers in Ballard.